Should you invest your marketing time and budgets in social media, inbound marketing, content marketing, banner ads, pay-per-click advertising or customer service? Investing in the wrong marketing channels will do little to help your business grow but can quickly challenge your team and waste your marketing dollars. A new digital marketing report from Forrester surveying more than 64,000 online consumers in the North America and 21,000 in Europe reveals interesting data about consumer reactions to different marketing channels. The biggest take-away for businesses and marketers: consumers trust self-selected content much more than push communications from brands. Not surprisingly, word-of-mouth marketing is the most successful way for businesses to reach customers. Seventy percent of U.S. consumers (61% in Europe) trust brand recommendations from friends and family (see chart below). 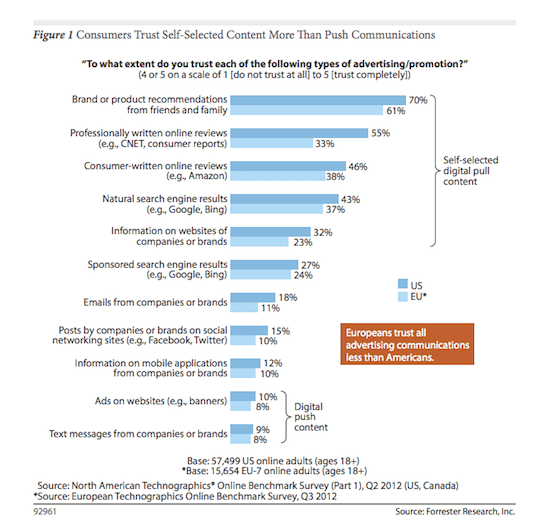 Most alarming for businesses: only 10% of consumers trust advertising. Nearly 90% of consumers don’t trust posts by companies or brands on social networks. Text messages from brands come in last – only 9% of U.S. consumers (8% in Europe) trust text messages from companies or brands. Banner ads are also at the bottom of the list. This shouldn’t surprise most people – banner ads have been ineffective for quite some time now and continue to lose relevance for most businesses. People have very short attention spans and have learned to ignore online advertising. Our own research and experience at crowdSPRING mirrors the results reported by Forrester. Our best performing marketing channel – by far – is word-of-mouth. 96% of our customers recommend crowdSPRING to others. As you can see from the graph above, there’s a good reason we’re proud of this fact: it’s one of the most effective ways to reach new customers. We’re also very proud of consumer-written online reviews for crowdSPRING. As you can see in the chart, nearly half of all consumers trust such reviews. Like many businesses, we also publish crowdSPRING reviews on our own site, but in our experience, independent reviews carry much more weight than reviews you publish on your site (and the Forrester data confirms this). What does your business do to promote and improve word-of-mouth marketing? We’d love to hear your stories – and questions – in the comments below.